And do you remember their oft-invoked counterpart? Little Lamb who made thee Dost thou know who made thee? No. I feared as much. It is true, then, that for many, William Blake stops there. Yet this poet, artist, publisher – this mystic Interpreter! – now finds himself subject of and to the Ashmolean’s most recent exhibition. And I, raised to an elevated position of expertise by one tutorial on the man, now find myself outside the exhibition doors as part of a distastefully keen 10am congregation of senior citizens and the only other conceivable type of person possible, the Blakean anorak. So was it worth it? That’s the question these reviews like to pose. But in an age when Google offers percentile answers, indulge me in what is at worst scriptural vanity and at best oblique elucidation, as I attempt to take a slightly different approach. I’ve got my milky oolong now, served up with a couple of shortbread biscuits, but we must wait while it brews, so in the meantime here is a brief little fiction. Imagine yourself, then, outside the National Gallery in London. You’ve just gone to see William Blake: Apprentice & Master and you are bowled over. You don’t live in London; you’re just visiting, either from abroad or from another decapitalised city of England. But wow! what a venue! what a collection! You hadn’t even come especially for it; instead, as you raised your selfie-stick up to immortalize yourself on top of a brass lion, you caught sight of that streaming banner depicting the elbow-contorted, fear-stricken, fire-flung figure from the Book of Urizen. You’re hooked, and you quite idly while away a good 2 hours marauding the rooms containing this exhibition. But ah! All this talk of fire has made me forget my tea. It has surely over-brewed now, so, reader, whilst I perform the arduous task of pouring, I must demand a further exertion of effort on your part. Would you kindly now relocate yourself back to Oxfordshire, to Beaumont Street, and to this very hotel from which we are afforded a most excellent view of the museum in question? Here, I have drawn you up a seat. Now unlike my spontaneous tourist, I reside more permanently in Oxford and certainly did not miss the build-up and advertisements for this Blake exhibition, rather, I positively sought it out on its opening day. It is because of this that I cannot, for all the literary merit it would deserve, mirror the exclamatives of that capital fiction above. But look, you must order yourself something to drink, and whilst you do, to pass the time, I’ll explain what it is exactly that’s stopping me from doing just so. It all boils down to what I look for in an exhibition. By way of comparison, let’s take the Remembering Radcliffe: 300 years of Science & Philanthropy exhibition (also currently showing) at the Bodleian Library. The theme is one of legacy. As you peruse the venue, plans for buildings, funds and projects bombard you with John Radcliffe’s marvelous generosity and enduring benefaction. Did you know, for instance, that, despite spending £700 on his own funeral, he most kindly gave his wife and daughter £100 for the purpose of buying linen? Add to this £100 per annum to buy books for his intended, name-bearing library! Nevertheless, the exhibition is pretty boring. One gets the impression that Radcliffe had demanded this self-congratulatory exhibition 300 years after his death, and this exhibition constitutes a dutiful fulfillment of that wish. As far as I was concerned, the exhibition can pithily be summarized thus: theme good – content bad. The exhibition struggles largely on the basis of uninteresting content. Heigh-ho. But look, here is your tea. May I pour? Now wait, don’t drink it just yet, let it cool a bit first. I’ll get down to specifics while you wait. 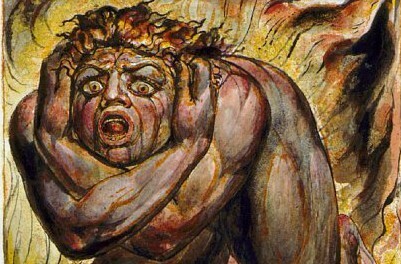 Unlike Remembering Radcliffe, my summary of William Blake is this: theme bad – content good. It can’t be denied that there is an impressive collection of work, focusing on him as etcher and the way this feeds into, influences and synthesizes with his work as poet. Emphasis was put largely on the developments of etching as art form, and this tallied nicely with the chronological layout. Blake progresses from copying others’ paintings, to etching his own, to relief etching and then to various methods of colour etching. Yet was this enough? If all this etching has led to your retching, I hope, reader, you can stomach what I have to say next… so go ahead and take a sip of tea. It’s calming, I assure you. You remember that earlier this exhibition was imagined to be in London? Well, since then we’ve all agreed it’s actually in Oxford. And why is this difference important? In the National Gallery, you walk in to vaulted ceilings; here, unless you’re a student, you pay £7 or £9 and enter at first a long rectangular room, low-ceilinged, darkly painted, and split further into 6 or so claustrophobic boxes. Centrally-hung ceiling spotlights shine theatrically onto each exhibit, yet as you approach, your own shadow falls upon each item like some ironic symbol of our 21st century, irreligious, pseudo-intellectual and superficial appreciation of Blake’s work. In contrast, on the walls hang over-lit Wikipedia-styled blurbs recounting aspects of Blake’s life, artistically copper-coloured to reflect his etchings, desperate to redeem the empty writing with a shimmering that, suggestive of novel exegesis, in fact renders unreadable what otherwise wouldn’t be worth reading anyhow. Ah, I notice the Randolph have also given you two shortbread biscuits with your tea! The Ashmolean similarly gives you two biscuits, of the philosophical kind that is. These come in the first half of the exhibition: one on the Blakean ‘inner eye’ and ‘divine imagination’, and the other on an anti-Lockean reading of relief-etching as metaphor for the idea that ‘if the Doors of Perception were cleansed everything would appear to man as it is.’ But, just as biscuits turn soggy, crumble and sink to the bottom of a cup when exposed to too much watery tea, so too did these fleeting philosophical morsels lose all form within the swamping volume of kitsch chronology and flattering phrases of admiration. The second half of the exhibition, to put this surprisingly apt metaphor to blunt use, needed a refill of something stronger than mere water. But an absence of any multimedia content, or screen-based exploration kept the exhibits disappointingly cased and visually distanced. By the final room, Blake became interwoven with his dedicated followers, the Ancients, and like a cup of tea gone cold, the exhibition faded out at some point vaguely simultaneous to his human death; the cool dregs of his successors’ immediate artistic mimesis served only to remind you that the beverage was never that great in the first place. But truly, my tea is cold. So I will take my leave after one final reflection: that, after 250 years, the Oxford community do not need a laudatory exposition of Blake’s work, regardless of how impressive this collection is. The absence of any thesis besides the chronological, in a place surely abounding with modern thought and scholarship, seems a missed opportunity for engaging with a public who, in a world blighted by the celebration of the ‘anniversary’, ought to be offered more by one of the world’s leading, scholastic museums. William Blake: Apprentice & Master is being shown at the Ashmolean Museum, Oxford, until 1st March 2015. In January, the Ashmolean will combine with Blackwells Book Shop to put on a 2-week William Blake festival. On Friday 30th January, there will also be a Live Friday event with the Blakean theme of Heaven and Hell.